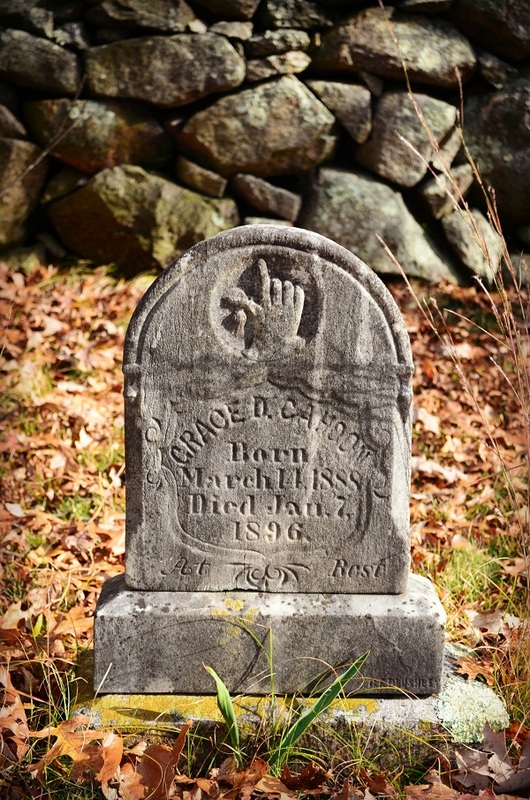 According to Audrey Mae’s artistically designed cemetery map and Audrey Mae’s gravestone numbering system in her Spencer Family Cemetery, Grace Cahoon’s gravestone is Gravestone Number Sixty-One. Even though this child was in the Spencer Family Cemetery, Audrey Mae was questioning how Grace was related to the Spencers. Relationship to the Spencers is unknown. Using her Smith-Corona typewriter in the late 1980s, Audrey Mae typed the following mini-biography of Grace. Audrey Mae had no more information on who Grace D. Cahoon was or why she was in the Spencer Family Cemetery. Audrey Mae was born in 1912 and this child Grace died in 1896 at the age of eight. No. 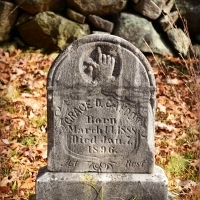 60 gravestone is of a baby whose name was George Spencer. This baby’s parents were Jess Spencer and Anna Cahoon. Therefore, this child Grace could be related to this Anna. More research is needed. Of note is that Audrey Mae’s brother’s, John Edward’s (“Ed’s”), daughter married into the Cahoon line of Coventry, Rhode Island in the middle of the twentieth century. This child of gravestone No. 61 died at the end of the nineteenth century. More research is needed.